Bethesda Softworks hosted QuakeCon 2016 this week. Several notable news items regarding future products from the company were announced, but what would a conference called “QuakeCon” be without something new on Quake? 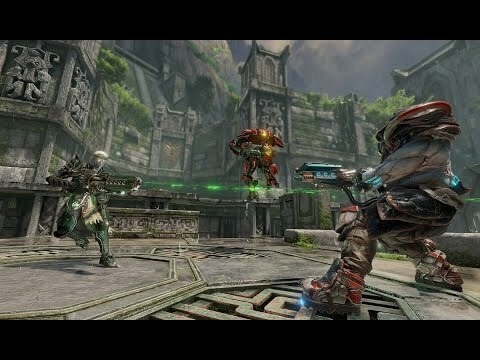 Despite how nice this trailer looks, Quake Champions is nowhere close to finished yet. It’ll be 2017 by the time anybody can play it — Bethesda has confirmed a closed beta will take place six months from now at the least. In true Quake fashion, you’ll have an arsenal of powerful and unique weapons, each of which will feel familiar to long-time Quake players. There’s no loadouts, and no limit to the amount of guns you can carry. Quake Champions will be going into closed beta in 2017, so it won’t be too much longer before you’ll be able to get your hands on the heart-thumping arena-style FPS and see for yourself just how fast it is, running at 120hz with unlocked framerates.